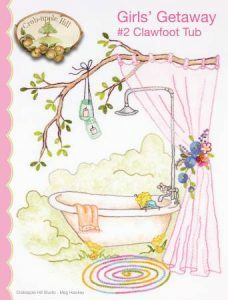 The first pattern in the series – The Girls’ Getaway – Pickup and Trailer by Meg Hawkey of Crabapple Hill Studio is in the top 20 patterns so we KNOW your customers are waiting for the second installment – Clawfoot Tub. This pattern is due to arrive next week – just in time for your summer events. Both patterns are a part of a mystery quilt that will be presented in 6 pieces over the next several months. There will be 5 patterns containing embroidered panel patterns, and one pattern with piecing instructions to complete the quilt. The floss requirements are listed on the back of the pattern on the website. Why not order everything and kit it? Your customers will be glad you did! This month, Crabapple Hill Studio is releasing the first of their new mystery quilt. The Girls’ Getaway will be presented in six patterns over the next several months – five embroidered patterns and a final pattern including the piecing instructions to complete the quilt. 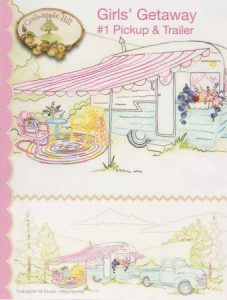 What could be more fun than a vintage aqua camp trailer with pink and white striped awnings? Add a vintage pickup, a flower filled window box, some comfy chairs, and we’re ready to snuggle in for a beautiful glamping weekend! This the first block, will finish approximately 31″ x 12-1/2″. Meg’s last mystery quilt – Mystery of the Salem Witches Quilt Guild – is still in the top 100 patterns so don’t miss out on this one. 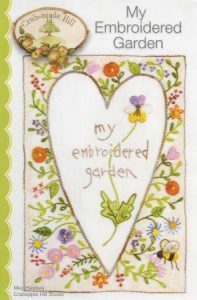 My Embroidered Garden is designed to teach all aspects of embroidery. 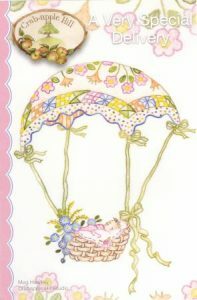 At just 4″ x 6″, it is a sweet little project pack full of happiness! What a perfect baby gift. Don’t all babies arrive in flowered baskets? 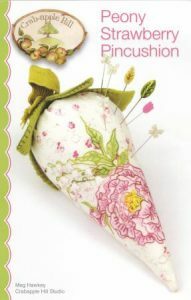 Or, why not make an heirloom quality pin cushion with beautiful lily of the valley and peony design? 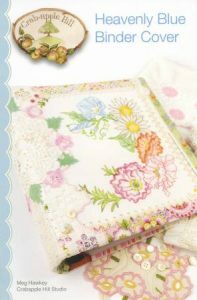 Last but not least, this journal cover would be a perfect Mother’s Day gift! Order them now so you will get the first shipment of these gorgeous designs. You know they will be perennial favorites!